"The Good Doctor" will preview Tuesday, March 5, and run March 6 to 10 at Waterman Theatre in Tyler Hall. The curtain rises at 7:30 p.m. for the weekday performances and at 2 p.m. for matinees on Saturday and Sunday, March 9 and 10. Directed by senior theatre major Wyatt Gilbert, "The Good Doctor" utilizes absurdity and surprise to illuminate the human condition in vignettes set in 19th century Russia, set to music with lyrics written by Simon and Peter Link. Gilbert said that in making the play his own, he seized upon Chekhov's premise: dealing with writer's block. "The vignettes are little dreams brought on by The Writer's frustration," said Gilbert, a Buffalo native who is set to graduate in May in theatre's acting/directing track. "The Writer takes notes as the scenes unfold." As a further touch for this production of "The Good Doctor," a supersized stained glass window featuring a cherry tree -- symbolizing one of Chekhov's most famous plays, "The Cherry Orchard" -- will light up more and more as the writer becomes increasingly inspired as the vignettes unfold, Gilbert said. "What's really cool is all the actors play four to five roles," he said. With titles such as "The Sneeze," "The Seduction," "The Drowned Man" and "The Arrangement," the vignettes will showcase the talents of Tim Brenner, who plays The Writer, as well as Kuryatin, Peter, Voice and Father; and four other student actors -- Evan Ribaudo, Megan Campbell, Shana Weiss and Adam Sommer -- each of whom also plays multiple characters. "It's been challenging but really fun to explore the characters with the actors, to make sure each one stands on its own," said Gilbert, who served as assistant director on SUNY Oswego productions of "Clybourne Park" and "Urinetown." Brenner is on stage "about 95 percent of the time," Gilbert said, grabbing clothes in his office to move in and out of characters. Chekhov, acclaimed as a short story writer and playwright during his lifetime in the late 19th century and beyond, wrote "The Seagull," "Three Sisters" and "Lady with the Dog," among many other works. The Simon-Chekhov original opened on Broadway in 1973 and ran for 208 performances. One actress, Frances Sternhagen, won a Tony Award; Simon married the other actress in the ensemble, Marsha Mason. While Simon, who died last August at 91, based "The Good Doctor" on Chekhovian tales, he framed it with comments made by a writer dealing with his own artistic temperament. Under Gilbert's direction, the vignettes take the form of The Writer's troubled dreams. "He (Simon) has done his research to incorporate Chekhov's life in the stories," Gilbert said. Chekhov, a physician as well as a writer who organized relief funds for the outbreak of famines and such diseases as cholera, died of complications due to tuberculosis at age 44 in 1904, according to the theatre department's Dramaturgy Hub for the play, https://sites.google.com/oswego.edu/gooddoctorhub/home, developed and maintained by senior theatre major Kiersten Mickle, under the supervision of theatre faculty member Toby Malone. In a vignette titled "Surgery," for example, a sexton visits the dentist complaining of a toothache, but the dentist's zeal for his profession begins to frighten his patient. In "The Sneeze," a government clerk over-apologizes and has a nervous breakdown after accidentally sneezing on the head of his boss during a night out at the opera. "The script is very funny," Gilbert said. "The cast is wonderful -- all of them have a sense of comic timing. They all vibe together really well." The play and music are licensed from Samuel French, a theatrical company. Two of the play's characters sing at one point in the show, Gilbert said, and their performance has grown substantially with coaching by another student, senior music major Nicholas Radford. Gilbert counts theatre faculty members Henry Shikongo and Jonel Langenfeld among his mentors. The director said he hopes the main audience takeaway is, "Even things we come in contact with every day and don't seem extraordinary in any way, they may one day be the inspiration for something else later on." Tickets for "The Good Doctor" are $15 ($5 for SUNY Oswego students). All tickets for the March 5 preview performance are $5 (free for SUNY Oswego students). Tickets are available at SUNY Oswego box offices, online at tickets.oswego.edu or by calling 315-312-3073. Patrons with disabilities needing assistance to attend should call 315-312-3073 prior to a performance. Parking is included in the price of a ticket and is available in the employee and commuter lots behind Culkin Hall and Hart and Funnelle residence halls. Writer's block -- Playwright Neil Simon’s “The Good Doctor,” based on classic stories by Anton Chekhov, will take the Waterman Theatre stage March 5 to 10. 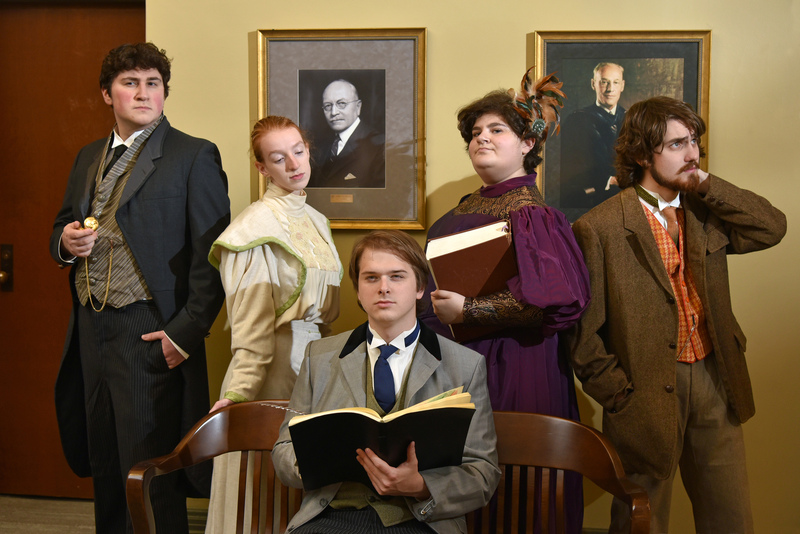 The series of 10 short plays with music will transport audiences to 19th-century Russia for an up-close view at absurd, surprising tales as this year's Blackfriars student honors production. The cast features Tim Brenner (seated) as The Writer and, standing from left, Adam Sommer, Megan Campbell, Shana Weiss and Evan Ribaudo. Each performer plays a variety of characters. For ticket information, visit tickets.oswego.edu.